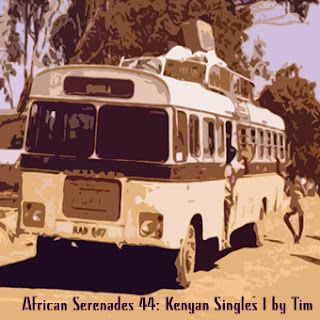 Due to the overwhelming number of requests to repost the African Serenades compilations I have finally relented with the reposting of two sets that focus on East African rumba-inspired sounds. These are from Tim, who has recently established the incredible KenTanza web-site. "I was also a long way out in the sticks at Lelmokwo, a village with no electricity and one shop. The nearest bar, at Mutwot, entailed a five-mile walk each way and we rarely made it into Eldoret. When we did, the town's one nightclub, the Olympic, owned by Kipchoge Keino, favoured Western music, which inevitably meant Boney M, Abba and Motown. The one record stall was by the bus station and sold cigarettes and sweets as well as a few records. "I saw a couple of bands while I was there, but both were strange occasions. Super Mazembe played at the Eldoret Agricultural Show, erecting a bamboo fence around the area where they were to play - no stage, just an awning - and charging 10KSh entrance. Since it was daytime, there was very little atmosphere and the impression was of a band just jamming and jamming, with a heavy rotation of players. Soe one who play drums for half an hour or so and then just get up wander off and someone else would take over. "The other band I saw was the Maroon Commandos, who were much tighter and slicker and put on a show. Unfortunately, it was at a local army base, so the audience consisted of about 500 soldiers, a truckload of women, who had been rather reluctantly bused in from local bars, and me." Great blog. Keep it up! any chance to repost it ? 50 is way too small, even us fans who check constantly cant get it. A though new rule indeed. The blog itself will suffer. way way too few downloads. Sometimes I can't check for a day or two. Knowing what I missed is worse than never hearing about it at all. I can appreciate the reasons behind the limited number of downloads - I don't like to keep live links on my own blog for very long, either. That said, it's awfully hard to keep up with your posts, given the limited number of dls you're allowing for. First, let me say that Matsuli is one of my regular stops when I'm surfing for new tunes. You have put together a great blog with many rare gems that have opened my eyes and ears to discovering new music. Lately, though, I haven't been fortunate enough to download any of the great music you have posted on here due to the limited downloads policy. I understand that this is your blog and you must have good reasons for carrying out this policy, but I have a few suggestions that you can take or leave as you wish. 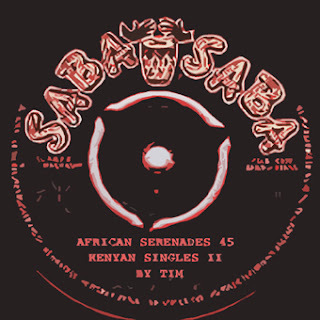 I think this site features the most rare, funky african tunes out there. However, because of the amount of traffic it receives, 50 download spaces are taken within 5 minutes of posting. That means that you could check 5-10 times a day to see if anything new had been posted, and still miss the opportunity to download the music. I have a suggestion as to how this problem can be alleviated. I know another blogger who provides download links to visitors through e-mail when they express interest in a certain post. After a person leaves a comment, they will then be notified through e-mail when the blog has been updated. I think this gives everyone a fair chance to download the music. I might employ this policy on my own blog in the near future, because I think it encourages people to comment about the music as well as creating a sense of community between the bloggers and their readers. I also suggest that the download limit be raised to say 300-500, so that more people are able to download the tunes and share their thoughts on it. Please take what you like and leave the rest. I just don't think its very fair. Well,well,well! Not what it used to be.Not as much interesting stoping by.So I quit. Good luck. This seems to me to be a cheap ploy to try to get people to obsessively check the site over and over again. Or perhaps a simple sop to the snob factor. Leaves a bad taste in my mouth--as much as I like this blog, if this keeps up I won't return. I will cry myself to sleep tonight on missing the opportunity to pick these up. Can I hope for a re-post maybe? Can you re-upload these downloads?